This beautiful Brewers pin was auctioned off by MEARS a couple years ago. It's relatively small - 1¼ inches in diameter. Blue text on a white background, union made. But even this deceptively simple pin has a story to tell us. 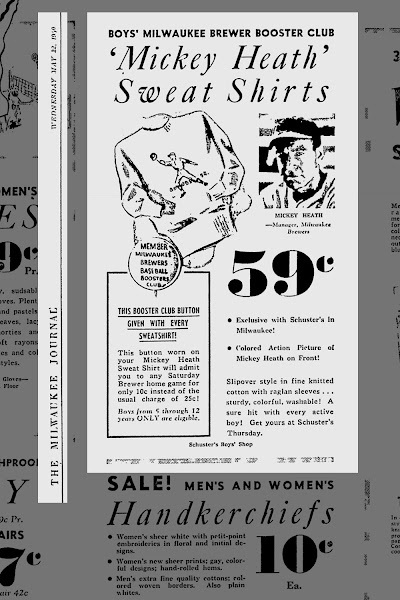 The story unfurls in this nearly-full-page ad for Schuster's department store, published in the Milwaukee Journal on Wednesday, May 22, 1940. 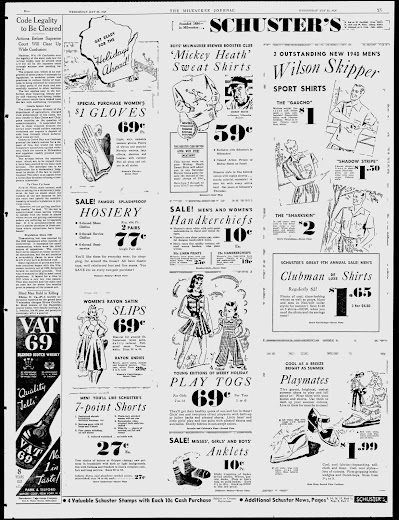 Right there, in the middle, an ad for 'Mickey Heath' Sweat Shirts. They were named after, and bore the likeness of, the Brewers' popular third baseman/manager. THIS BOOSTER CLUB BUTTON GIVEN WITH EVERY SWEATSHIRT! This button worn on your Mickey Heath Sweat Shirt will admit you to any Saturday Brewer home game for only 10¢ instead of the usual charge of 25¢! Boys from 5 through 12 years ONLY are eligible. "Boys"? That's regrettable. 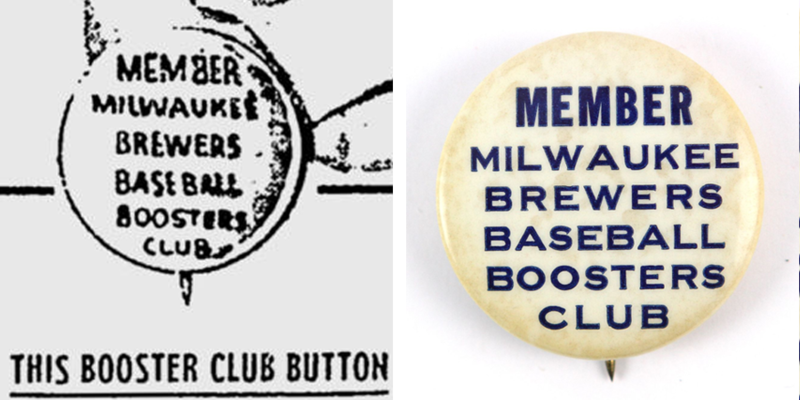 It's not as though Milwaukee didn't have notable female baseball fans. 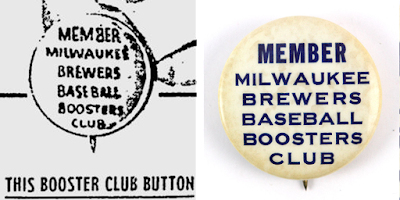 Unless this "Milwaukee Brewers Baseball Boosters Club" was some sort of exclusively-male response to the all-women "Milwaukee Brewers' Boosters" fan club formed two seasons earlier. Which would be even more regrettable. Especially when supported by a local department store. 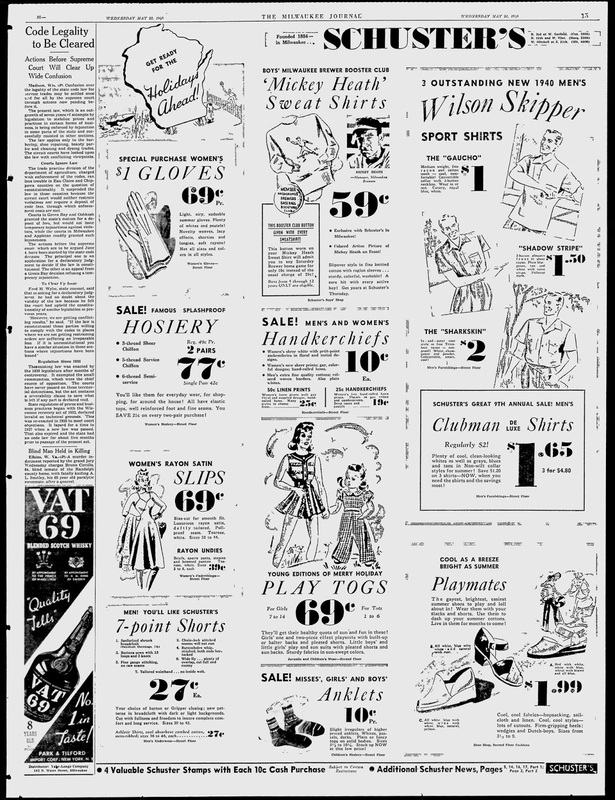 But fifty-nine cents? For a sweatshirt? That's a whopping $10.56 in April 2018 dollars. Not a bad deal at all. And with it, kids received this very button, and discounts to the ballpark. The Brewers struggled in 1940, and Heath was fired after getting tossed from a game on July 20th arguing a called third strike. He was replaced as manager by former Brewer (and member of the 1919 "Black Sox" team) Ray Schalk. I wonder how many of these were worn to Borchert Field that summer. 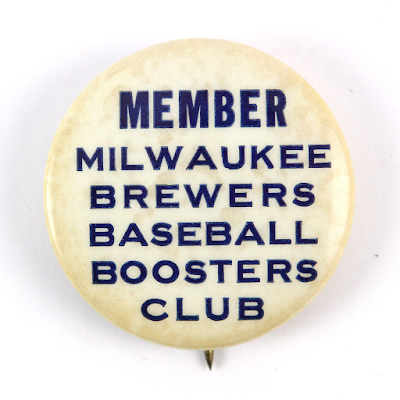 Today, it's a rare artifact from Milwaukee's grand baseball history.